This outage slowed down websites (the browser load event) on Black Friday and Cyber Monday and caused many website services to fail for 40% to 50% of traffic. Without these conversion-critical services, retailers impacted by the outage lost significant amounts of revenue on the busiest shopping days of the year. What is IBM Digital Analytics? IBM Digital Analytics is a SaaS analytics provider that many enterprise eCommerce sites use to understand buying behavior, monitor marketing campaigns, and track product sales. It is a very robust analytics service that provides sites with very powerful insights. 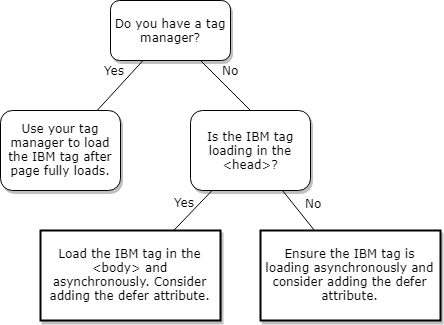 One of the prescribed implementations of IBM Digital Analytics is to load the required files in the <head> section of a web page. Placing content or services in the <head> of a page should be done sparingly because items set to load in the <head> can slow down the rest of a page and delay the browser’s load event. Since many website services are designed to not function until the load event occurs in the browser, delaying the load event can impact site usability, functionality, features, and aesthetics. 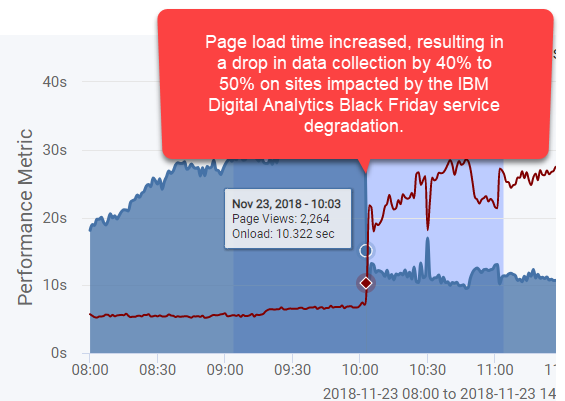 The IBM Digital Analytics outage began at 10:03 EST on Black Friday (11/23/2018). The outage caused the browser load event to be significantly delayed for sites loading IBM Digital Analytics in the <head>. The browser loading spinner continued to spin unless you waited a minute or so for IBM’s content to finally time out or fail. As a result, critical website services designed to load after the load event could not function for 40% to 50% of traffic. 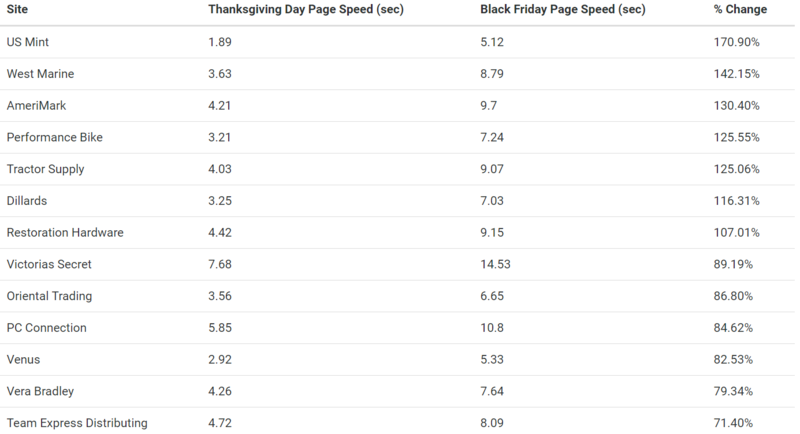 Web pages slowed down significantly, but Black Friday shoppers could still view products, add to cart, and checkout. Powerful services that have real business value could not function for a large portion of traffic. These services include live chat, re-targeting, and analytics for real-time decision making. Since the outage caused the browser icon to continue spinning, many shoppers waited for it to stop (up to 60 seconds) and others gave up and left. Our analysis indicates that IBM’s outage reduced analytics data collection down to 40% to 50% of traffic, which means that sites were flying blind and could not make fully informed decisions on one of the most critical shopping days of the year. As a rule, site owners are advised to not load third party content in the <head> of a page unless necessary. If those services fail they could bring down the site or severely impact site capabilities. The IBM outage did not prevent people from buying, however the outage reduced the competitiveness of these sites while the outage lasted or until mitigated. Key metrics impacted were Average Order Value (AOV), Conversion Rate, and attribution from retargeting. Our eCommerce clients were able to quickly identify and remediate this issue with Blue Triangle's Digital Experience Analytics platform, which includes Tag Governance for analyzing third party service issues.